The Husky 1/4 inch x 1/4 inch NPT Female Industrial Steel Coupler eliminates coupler confusion. The durable zinc-plated steel body resists corrosion and features one 1/4 inch snap-in and one 1/4 inch screw-on fitting. A nice addition to any workshop. Requires a plug with an identical body size for interchanging. 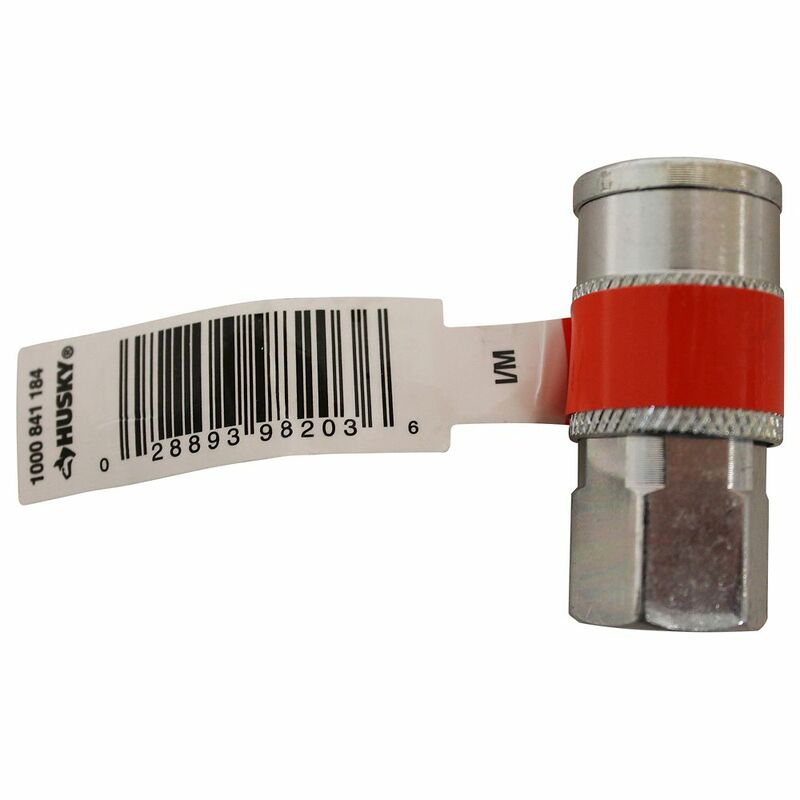 The Freeman Industrial 1/4 Inch x 1/4 Inch Accessory Pack offers a great variety of pneumatic fittings at a great price. Accessories include snap-in connectors, couplers, Teflon thread tape, tire and sports equipment inflators. Excellent kit whether you are just getting started with pneumatics or are restocking your supply. The Husky 7-Piece Air Tool Accessory Kit features a tubular-valve design that promotes high flow rates to help provide maximum performance. Plugs and couplers provide quick changing between tools. This is a perfect addition to any garage or site wherever pneumatics is used. This kit includes 2 couplers with 1/4 inch (F) NPT, 2 plugs with 1/4 inch (F) NPT, 2 plugs with 1/4 inch (M) NPT and 1 connector 1/4 inch (M) NPT x 1/4 (M) NPT. The Husky 1/4 inch NPT Male Coupler is used to connect components to an air compressor. It is crafted with heat-treated brass for strength, and it features a sleeve guard that reduces the potential of accidental disconnects and works to protect the coupler sleeve. Simply place the coupler at the tank, end of hose, or both. Use with 1/4 inch I/M plug. 1/4 Inch Female Coupler, Steel The Husky 1/4 inch x 1/4 inch NPT Female Industrial Steel Coupler eliminates coupler confusion. The durable zinc-plated steel body resists corrosion and features one 1/4 inch snap-in and one 1/4 inch screw-on fitting. A nice addition to any workshop. Requires a plug with an identical body size for interchanging.